VentureVerse is a top-down action-adventure game with a focus on exploration, discovery and user-generated content. The game allows you to explore the Island Province of Ulora and conquer its many dungeons whilst unlocking a plethora of items to alter your playstyle. Players can also create and share their own dungeons with the in-built level editor, providing a large array of tools ranging from beginner to advanced difficulty. The game takes some inspiration from the likes of The Legend of Zelda, LittleBigPlanet and FTL: Faster Than Light, blending various elements from all three. VentureVerse is being developed by Matt Capener and features an original soundtrack by Emmanuel Lagumbay. It is set for an Early Access release in 2017 on PC, with Mac and Linux versions planned after. Conquer the varied and hand-crafted dungeons of Ulora. 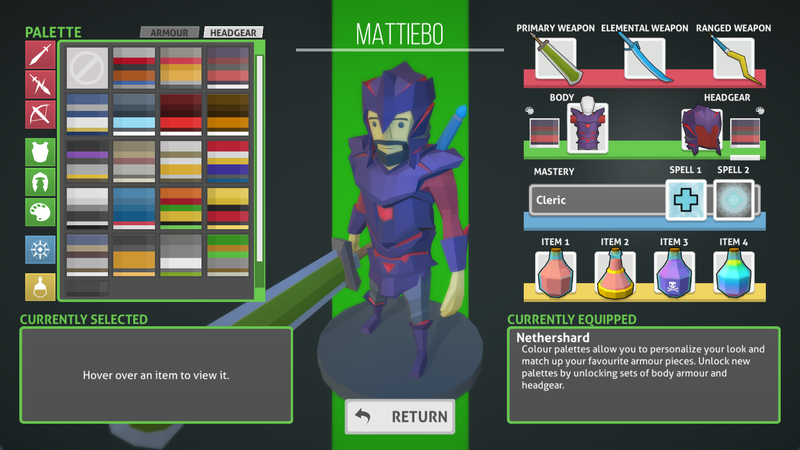 Unlock a plethora of new weapons, armour, masteries and items to mix up your loadout. Explore the Island Province of Ulora, travel between its cities and take on random encounters. 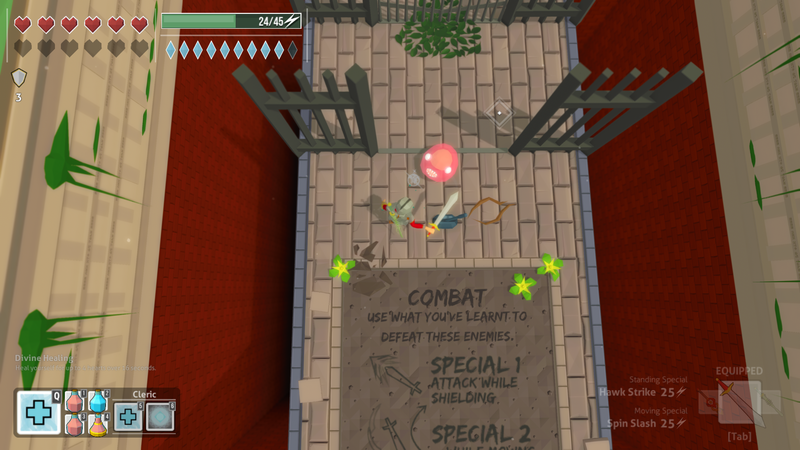 Create and share your very own dungeons using the advanced level editor. The majority of VentureVerse is played within the varied and hand-crafted dungeons. These range from decrepit ruins and technology-rich laboratories to mysterious ancient monuments and even the odd golf course. Dungeons are filled with deadly enemies, perplexing puzzles and diverse challenges which take advantage of the ever-growing list of dungeon elements designed to add fun new mechanics. Gameplay is expanded with the Gear system, allowing the player to use special items like the Grappling Hook and Avii Grabber Gloves to traverse the level, solve puzzles and increase their arsenal of attacks. 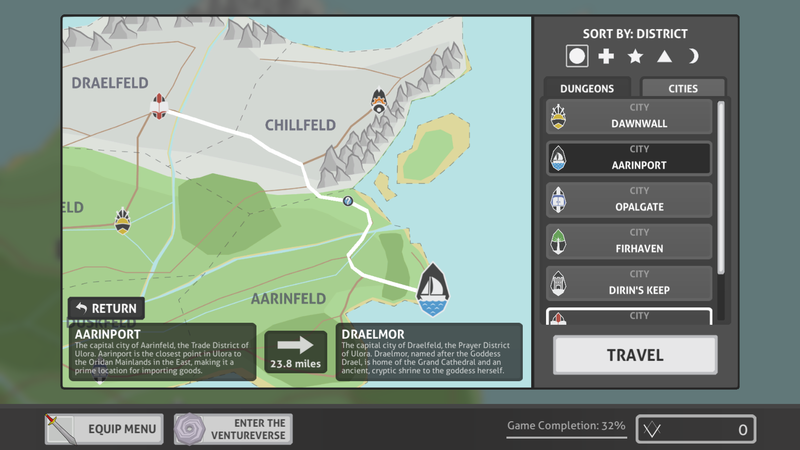 The Travel Menu (shown above) allows you to traverse the Island Province of Ulora, primarily to travel to dungeons and cities. Each city has a variety of services such as the Inn where the player can restore their health and the Blacksmith where they can buy weapons and armour. Each city also has at least one unique service. Travelling can bring unexpected surprises however, with random events popping up around the map. These events, shown on the map as a question mark, can give you interesting multi-choice scenarios or throw you suddenly into a fight. Ulora is filled with dungeons, but at any time the player can enter the VentureVerse to play other playerâ€™s creations. Playing a user level will give the player all the same bonuses that playing a built-in level give will give. 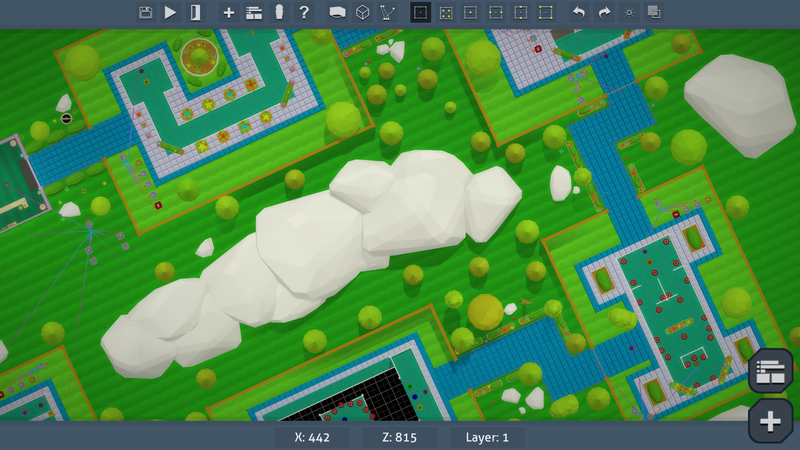 VentureVerse comes with a built-in level editor which allows players to create all kinds of levels. The editor is simple to use at a base level, but advanced users will be able to create complicated custom puzzles and unique level types, such as the Spin-Disk Golf level shown above. A large variety of logic including AND/OR/XOR/NOT gates, camera position switcher, player teleporter, selector, sequencer and much more. An actor system allowing the player to create an actor and control them with animations and waypoints. up to 6 different wall styles and 24 different floor styles per level. A simple object settings menu available for most objects. An object modifiers system, allowing the player to add additional functionality to objects in the game, such as moving or hiding the object. VentureVerse will launch with a variety of content to demonstrate the potential of the game, but new content will be frequently added with the help of player feedback. Along with new dungeons and map events, players can expect new weapons, armour, heagear, masteries and consumables in the updates along with new editor objects.